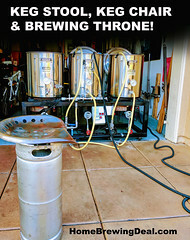 Coupon Description: MoreBeer.com currently has a coupon code that can save you some cash when you buy a homebrewing burner stand by camp chef. Included leg extensions raise burner to a height of 22″. Burner has 60,000 BTU rating. Now Includes a 6″ stainless handheld Thermometer! Coupon Description: MoreBeer.com currently has a coupon code that can save you some cash when you buy a magnetic stir plate . This More Beer coupon code is for a magnetic stir plate to cultivate yeast for either homebrewing or home wine making. 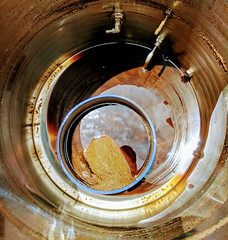 One of the keys to a healthy and complete fermentation is starting with a large amount of active yeast. One of the best ways of achieving that is by creating a yeast starter with one of these magnetic stir plates. The magnetic plate will stir a coated stir bar inside your flask, placing the yeast in contact with more sugars and speeding up their reproduction. I highly recommend using a stire plate. Coupon Description: HomebrewSupply.com currently has a promotion going on where you can save big and get a 5 Gallon Homebrewing Keg for just $58.95! These homebrew beer kegs are fully cleaned and pressure tested. They are refurbished ball lock kegs are ready to go. You never have to bottle beer again. These kegs are stainless steel and make sanitization a breeze. They also come with a rubber base and handle for easy transportation. Coupon Description: MoreBeer.com currently has a coupon code that can save you some cash when you buy a Draft Beer Tap Tower . This More Beer coupon code is for a 2 faucet draft beer tower for serving your homebrew! This is a highly rated draft beer tower, all chromed out and ready to serve your home brewed beer in style. It has two tap heads. Super Homebrew Deal – 8 Gallon Brew Kettle for Just $50! 8 Gallon Brew Kettle for Just $50! Promotion Details: 8 Gallon Brew Kettle for Just $50! 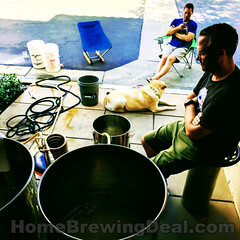 Coupon Item Description: Adventures in Homebrewing has yet another great homebrew sale going on. If you act now, you can pick up a stainless steel 8 gallon homebrew kettle with a ball valve port for only $50. This Homebrewing.org sale is for a homebrewing stainless steel brew kettle. This is a seriously great deal and is only available for a limited time. Northern Brewer currently has a promo code where you can save $50 off of their MegaPot line of homebrew kettles. These are good economy grade kettles and if you act now you can get one at a good price. This Northern Brewer promo code is good for today only. Coupon Description: MoreBeer.com currently has a coupon code that can save you some cash when you buy select hops at MoreBeer. This More Beer coupon code is for 10% off on select hops. If you were planning on replenishing your hop stock pile, now may be a great time to do so. If you order now, you can save 10% on select hop varieties. 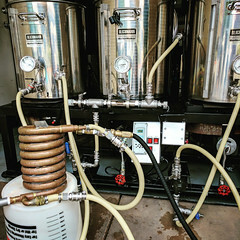 Coupon Description: MoreBeer.com currently has a coupon code that can save you some cash when you buy a Stainless Steel Wort Chiller. This More Beer coupon code is for a Stainless Steel Wort Chiller. This is a great stainless chiller regardless if you are doing extract brewing or all grain home brewing. It works great for 5 gallon beer batches and helps you bring your wort from a boil down to yeast pitching temperature fast! Coupon Description: MoreBeer.com currently has a coupon code that can save you some cash when you buy a Taprite Dual Body CO2 Regulator. This More Beer coupon code is for a Taprite Dual Body CO2 Regulator for your homebrewing draft beer system. With this CO2 regulator you can keg and pressurize multiple kegs at different CO2 levels. 25% Off Homebrew Grains, Hops and Yeast! Promotion Details: 25% Off Homebrew Grains, Hops and Yeast! Coupon Description: HomebrewSupply.com currently has a promotion going on where you can save 25% off the purchase of your home brewing grains, homebrew hops and beer yeast! If you are looking to save some money on your next batch of homebrew, you should check out this deal from Homebrew Supply. If you act now, you can save 25% off of your purchase of grains, hops and yeast; making this a great time to stock up since they are also offering $7.95 flat rate shipping on most orders. This is a great sale and includes an awesome lineup of hops like Citra and Simcoe!